Cool idea! Thanks for sharing this game. 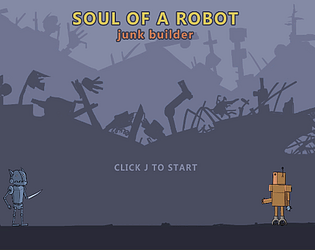 (mine is also about robots :) The attack animations and art were really nice and I'd love to see where this could have gotten with more time and team members to polish it up. I felt like the dude attacking the motionless mannequin in the Karate fail video. I'd love to play a polished version of this! 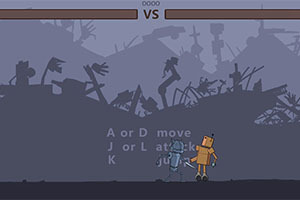 Really cool art and idea, I mean a versus game with robots, do it! But yeah it's not really enjoyable right now. Really nice artwork and animations. 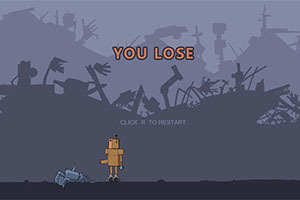 The gameplay is a little basic though as the enemy just stood there and got clobbered. 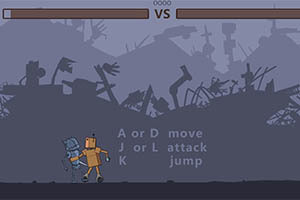 Seems like an ambitious idea to do a AI brawler, but its cool that you tried! Thanks. Actually enemy could simply attack. But some error make that just stand there. Thanks your feedback. after voting step finished i will fixed this. 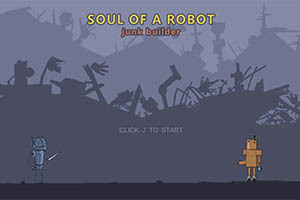 Cool art but the other robot dont do anyting. It would be cool if the robot did stuff though. The other robot doesn't do anything, made me feel bad for beating it up. I played it a second time and let him just walk by me lol. Nice Job though, I really like the art! Thanks! When i found that bug i already have no time to fix. Just have 5 mins to deadline. So i submitted.